Having piercing spasms in the muscles of the hands or feet is a painful issue in itself; however, the reasons behind the spasms can put your life in danger. Carpopedal spasm is linked to health conditions that often result in seizures or heart palpitations. While these spasms may be brief, a sudden, unexpected pain can send your mind racing as to the underlying cause. We will look at carpopedal spasm causes and the accompanying signs to watch for. As with any condition, prevention is the best medicine, and adhering to a carpopedal spasm treatment plan is key. A carpopedal spasm is not the most common medical condition we may hear of, but it is a widespread condition among those with disorders like respiratory alkalosis (excess amounts of alkali in the body due to hyperventilation) and tetany (muscle cramping due to mineral deficiencies). This painful twitching or contraction of a muscle in the fingers, wrist, toes, or ankle can also be caused by low calcium levels. Let’s learn about other causes of a carpopedal spasm. The carpopedal spasm symptoms are closely related to symptoms of regular muscle spasm conditions. 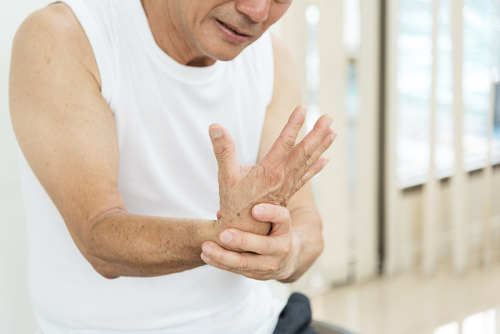 With a carpopedal spasm, one or more of the following symptoms can be experienced more frequently than a normal muscle spasm in the finger, thumb, wrist, ankle, toe, or foot muscle. Carpopedal spasm treatment focuses on the specific muscle affected, as well as the primary cause behind the spasm. If it is caused by thyroid conditions, the hypothyroidism or hyperthyroidism is treated. Any carpopedal spasm related to pregnancy will most likely dissipate once the baby is born. Low calcium levels can be replenished by consuming calcium-enriched foods such as salmon, sardines, leafy green vegetables, raw milk, yogurt, cheese, almonds, sesame seeds, chia seeds, tofu, orange juice, and fortified cereals. We all know we can increase our vitamin D levels by having daily exposure to sunlight, but we can also help a vitamin D deficiency with our diet. Eat mushrooms, salmon, sardines, tuna, mackerel, egg yolks, milk, cheddar cheese, yogurt, almond milk, fortified cereals, poultry, and lean beef. Stretching the muscles may help to ward off episodes of spams by preventing the muscle from expanding or shrinking. Stretching can involve physical activities like swimming, strengthening exercises, and aerobic workouts. It is also important to avoid overworking the muscle while performing these exercises. Our muscles and tissues need plenty of water to function properly. A lack of fluids can lead to a decrease in muscle tone. The harsh chemicals in a cigarette can draw out fluid, calcium, and other essential nutrients. Avoid smoking, and if you do smoke, get the necessary help to stop. Excessive intake of caffeine products and alcohol can impair the body’s ability to process any calcium absorption. Check your childhood vaccine record to ensure you have received a tetanus shot. A booster shot is necessary every 10 years. Carpopedal spasm episodes can come on suddenly without any warning, and can set off alarm bells with the excruciating pain it presents. A twitching or sharp, jerking movement of a muscle in the digits of the hand or foot is considered a carpopedal spasm. This can also happen within the wrist and ankle. Most times, these spasms can be caused by a lack of calcium or vitamin D in the body. Any health condition or ailment that causes the muscle to expand or contract can also lead to these types of spasms. A carpopedal spasm can be accompanied by numbness, weakness, and a tingling sensation in addition to extreme pain. Treatment starts with the cause of the spasm, and may be as simple as keeping hydrated or increasing calcium intake. “Carpopedal Spasm,” Drugs; https://www.drugs.com/cg/carpopedal-spasm-aftercare-instructions.html, last accessed July 19, 2017. “What Causes Carpopedal Spasm? Its Symptoms And Treatment Options,” Tandurust, July 31, 2013; http://www.tandurust.com/muscles-disorders/carpopedal-spasm-causes-symptoms.html, last accessed July 19, 2017. Salina, “Symptoms Of Carpopedal Spasm: Its Causes And Treatment Options,” Simple Remedies; http://www.simple-remedies.com/muscle-joints-bone-disorders/carpopedal-spasm-causes-treatment.html, last accessed July 19, 2017. Lewis, J., “Respiratory Alkalosis,” Merck Manuals; https://www.merckmanuals.com/professional/endocrine-and-metabolic-disorders/acid-base-regulation-and-disorders/respiratory-alkalosis, last accessed July 19, 2017. Stoppler, M., “Muscle Cramps,” MedicineNet; http://www.medicinenet.com/muscle_cramps/page7.htm, last accessed July 19, 2017.